If you read the opening post of Product Awareness Month, you would have read about the concept of Productizing Our Technology (POT). By taking our core tech, combining the available features, with new jQuery scripts, CSS, and some 3rd-party integrations, it’s possible to create a plethora of new “mini-products” that if embraced by the community, could inform future product direction. When we created an initial list of product ideas, expanding upon what the base product can already do, I realized that — as we’ve moved from a single product to multiple — we’d not changed our perception of who the functional buyer persona is. If you look at the table below, notice how product #1 is a standalone landing page used primarily for paid ad campaigns, but products #2 and #3 are designed to be used primarily on your website. Primary Use Case Use standalone landing pages to convert more of paid (AdWords) traffic. Use on website pages to convert more organic traffic. Use on website pages to convert more organic traffic. Note: that for the personas listed, these are intentionally general, as it’s still part of our discovery. My goal is simply to show that they are most likely different. We didn’t immediately realize that the teams using these products may not even be in the same department (marketing vs. web team vs. software development), for example. Or if they are in the same department (marketing), they might not work together on a daily basis. This is a huge problem because it assumes that someone who runs paid campaigns is also going to be optimizing the organic traffic to a website, and is no doubt one of the reasons for low adoption of product #2 and #3. A WTF Moment – How Could We Be So Blind? 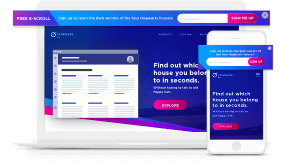 When we talked to our customers and community members, we uncovered a startling fact: most people thought that the new products could only be used on Unbounce landing pages. Yes, you can, if you want. But the primary use case for the new products is for your website. We really didn’t see this misconception coming, which shows how important it is to always talk to your customers. If you have more than one product, or if the users of your single product have different job roles, are you targeting and communicating with them in different ways? Or have you assumed that everyone will understand the same messaging? Web developers are not very likely to be downloading an ebook about marketing, and thus will not be on our mailing list to hear about new products that could, in fact, make their job easier and more productive. So, today, I’m going to share some of the functional use cases of popups and sticky bars that would be used by the UX and web teams that work on and manage your website. This is a very different market than we normally speak to, but super important as some of our research has indicated after the initial launch. As I explore these use cases, try to follow along with your own products, to see if there are ways that you can create new mini products from the technology you possess. The core technology is denoted as LP (Landing Pages), POP (Popups), SB (Sticky Bars). In the table below you’ll find 25 of the ideas we came up with — that I selected from of a total of 121. Follow our Product Awareness Month journey >> click here to launch a popup with a subscribe form (it uses our on-click trigger feature). Video Interaction Offers Having a CTA embedded in a video is great, but it’s very limited in its ability communicate more than a few words. As you can see, there are a ton of new use cases for the products, which are useful to a completely different set of functional users. Unless we do something to specifically target these new functional users, adoption won’t be our only problem, acquisition will be too. How can you target different functional users? One way to start validating these use cases is to create new product pages for them to see if you can attract some organic traffic. In our case, this would allow those searching for this type of product to arrive on our website where we may be able to demo the product as part of the experience. Another approach is to explicitly connect the different team members, through suggestive email copy. For instance, we could email our customers and educate them that our product can help others on their team – getting the conversation started. This has the benefit of communicating through an established brand advocate. One of our goals with POT is to gather insights into which new product ideas are in demand. There will without question be an increase in technical support questions based on the implementation requirements of these ideas, but I consider that a good problem to have. If there’s enough call for full productization, that’s a great way to increase adoption and the stickiness of our products. How many new products could YOU build? I’d love to hear in the comments how you can imagine doing this with your own software/products/services. Please jump into the comments and let me know. If you’re worried about your competitors stealing your ideas (I definitely thought about that when I decided on this approach – but I’m erring on the side of our core Transparency value), you could simply mention how many you think you could come up with, which is also very cool.